I was designing icons for an eLearning project and had to build a button with different states. I had started all in Adobe Illustrator, lately my program of choice, and thought about using layers to build each state in, but what a hassle having to switch to each layer screen to work. Then it struck me, why not use Artboards for each state. I can line up all the Artboards in one window and go from one button to the next without having to make extra clicks and I can duplicate Artboards for altered states. Then I started thinking of so many uses for Artboards; multipage website layouts, two sides print brochures, and even something text heavy like a newsletter. By default Illustrator opens with one Artboard, but there are two places additional Artboards can be added. When you launch any new document there is a set-up panel that can be edited with the number of Artboards you wish to add, among other things. Or you could already have the document open and want to add Artboards. 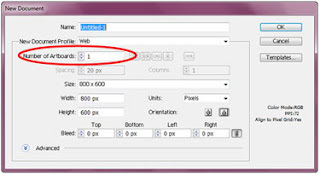 In that case click on Windows from the main navigation at the top and click on Artboards from dropdown. This will add an icon to the control palette on the right. 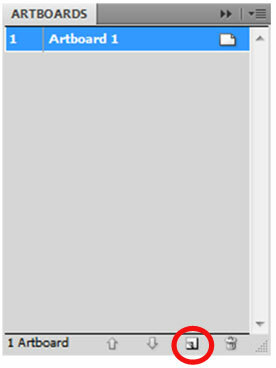 Click the icon to open the window, and clicking the little paper icon at the bottom will add an Artboard. Maybe you need to resize an artboard, or have them all different sizes, no problem. Click the Artboard Tool from the tool palette on the left. Notice how one of the Artboards now has little handles on it. Just click and drag to the size you desire. With the Artboard Tool still selected click on the other artboard to select it and edit as desired. You can even click on either Artboard and drag it to a different place in the window. One of many features that I use is setting the rulers to Global or Individual. What that means is I can have a ruler for each Artboard or a ruler that spans all of the Artboards. This is a big help with laying out a multipage document. You can also flow copy across all of your artboard pages or whichever ones you wish. Try using Artboards for your next project!